New York Coin and Bullion, Inc. (NYCB) was founded on the principles of sound and professional business practices and on the highest industry standards for numismatic excellence. Our relationships with grading companies and auction houses ensures that we are a leading provider of the finest available gold and silver coins and bullion on the available market. 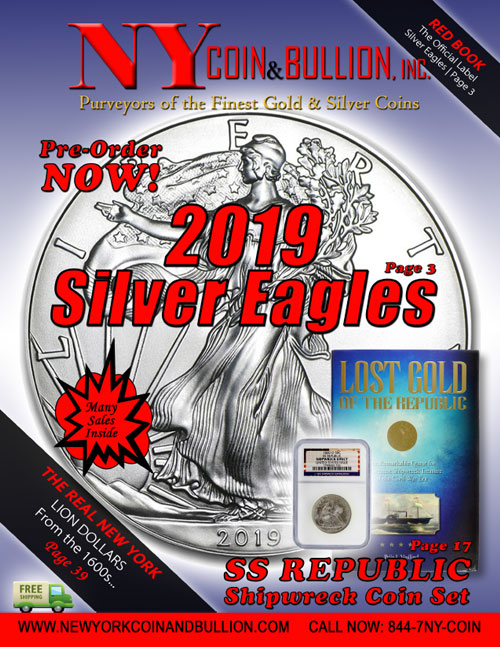 From antiquities to new to the market items (like the 2016 American Silver Eagle “30th Anniversary Edition” Coin) we provide our extensive client and collector base with timely products, hard to find items and competitive pricing. We’re also a leading company in buying coins direct from clients looking to get the best pricing on their collections. Whether you’re new to numismatics or a seasoned collector, NYCB is your one-stop location for buying and selling rare coins and bullion. Browse our collection and speak with one of our highly trained numismatic specialists to answer any of your questions. NYCB is committed to the service of each and every one of our clients.